The Labor Department reported that the economy added 257,000 new jobs in January. With upward revisions to the prior two months’ data, this brings the average over the last three months to 336,000 jobs. The unemployment rate was essentially unchanged at 5.7 percent. Adjusting for changes in population controls, the household survey still showed an increase in employment of 435,000 in January. The job growth in the establishment survey was widely spread across industries, but it is noteworthy that the goods production sector remained strong. Construction added 39,000 jobs, bringing the average over the prior three months to 37,700. Manufacturing added 22,000 jobs bringing the average over the last three months to 31,000. The oil and gas sector is showing the impact of falling prices, with employment down by 1,900 in January. Employment in coal mining also fell by 700. Over the last year, the coal industry has lost 4,800 jobs with employment now standing at 71,300. Retail added 45,900 jobs in January, while health care added 38,300. The latter figure continues an uptick in job growth in the health care sector that began in the fall. Job growth had averaged under 14,000 a month in 2013 and 19,000 in the first half of 2014. It has averaged 39,000 a month since September. The temp sector showed a loss of 4,100 jobs in January after gaining 55,800 jobs over the prior two months. 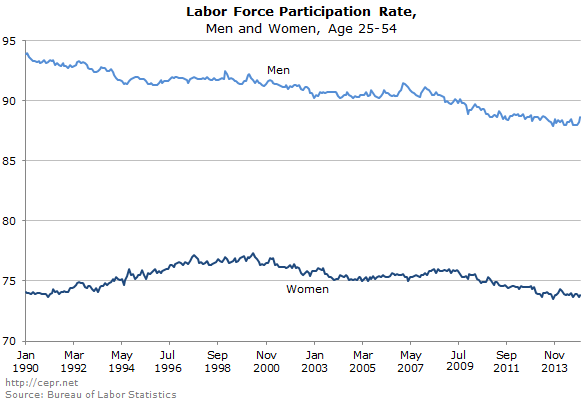 This more likely represents an erratic movement in the data than a reversal in employment trends in the sector. Restaurant employment rose by 34,600, almost exactly equal to its growth rate over the last year. The government sector lost 10,000 jobs, but most of this was due to the loss of 6,100 jobs in the Postal Service. There was a 12 cent jump in average hourly pay, but this reflects the erratic movement of this series, not a real development in the economy. Taking the last three months together, compared with the prior three months, wages have grown at just a 2.0 percent annual rate, down from a 2.2 percent increase over the last year. In other words, there is still no real evidence of wage acceleration in the data. The household survey showed little change in the employment situation for most groups. It is striking that less educated workers continue to be the largest beneficiaries of the recovery. In the last year, the employment rate (EPOP) for workers without high school degrees has risen by 2.1 percentage points, while their unemployment rate has dropped by 1.1 percentage points. High school grads have seen a similar drop in their unemployment rates, although their EPOP has risen by just 0.2 percentage points. By contrast, the unemployment rate for college graduates has fallen by 0.5 percentage points, while their EPOP has dropped by 0.7 percentage points. The unemployment rate for college graduates is still 0.8 percentage points above its average for 2007. While the unemployment rate edged up, the overall EPOP also rose, hitting 59.3 percent, a new high for the recovery. However this is still 3.7 percentage points below the average for the year before the recession. Contrary to what is frequently claimed, most of this decline is due to prime age workers (ages 25-54) dropping out of the labor force. 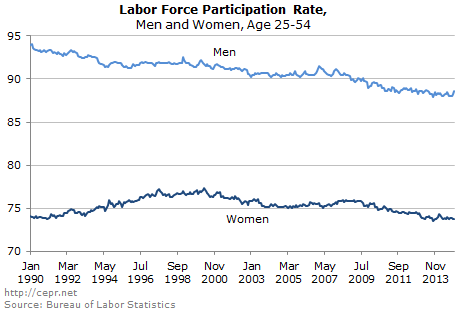 That reversed the pre-recession trend, in which the percentage of both prime age men and women in the labor force had been rising. The number of people involuntarily working part-time was little changed from December but was 453,000 below its year-ago level. Voluntary part-time is up by 535,000 from a year ago. Another positive item was that the percentage of unemployment due to people voluntarily quitting their jobs hit a recovery high of 9.5 percent. This is still far below the rates of more than 11 percent before the downturn and more than 14 percent in the 1990s boom. The January report provides further evidence of a strengthening labor market. However, the weak 4th quarter GDP growth, coupled with a rising trade deficit and continued weakness in investment, should raise concerns about its durability. The labor market is not yet tight enough to produce substantial wage growth, which means that future consumption growth will be limited. There has been no acceleration in wage growth even as the unemployment rate has fallen.